Dutch is one of the most unique languages in the world, and is often considered along with German to be particularly challenging for the newly acquainted. So what is easier to learn Dutch or German? Perhaps the most reassuring thing about the Dutch language is how closely it resembles English, which in turn also has Germanic roots. Speaking both English and German will give you a considerable advantage when learning Dutch. However, while Dutch shares many similarities with English and German, it’s important to understand where the similarities end and nuances begin–and then embrace them! Fluency may not come right away, but when questioning what is easier to learn German or Dutch, it all comes down to practice. There’s a common joke among historical linguists that if William the Conquerer hadn’t invaded England and introduced the Norman culture–namely the language–it’s very likely that English and Danish would be all but interchangeable. Because of the heavy French influence on the English language, however, those similarities are somewhat diminished. Many people who have studied Dutch note how closely it resembles the decadent Shakespearian or Irish English in many aspects, namely pronunciations. (For example, “the” is pronounced as “de”.) Many words like “open” are the same in both languages, and one speaker notes that Dutch spoken in passing on the streets could very well pass for swiftly spoken English. Another example is the word “sorry.” In English we often used “sorry” to either indicate regret or conversely, that we didn’t catch something that was said to us. These “loan words” can also be found in the Dutch language, which can often be confusing until you get the hang of them. Don’t worry if you occasionally mix up certain word uses, as that’s entirely normal. 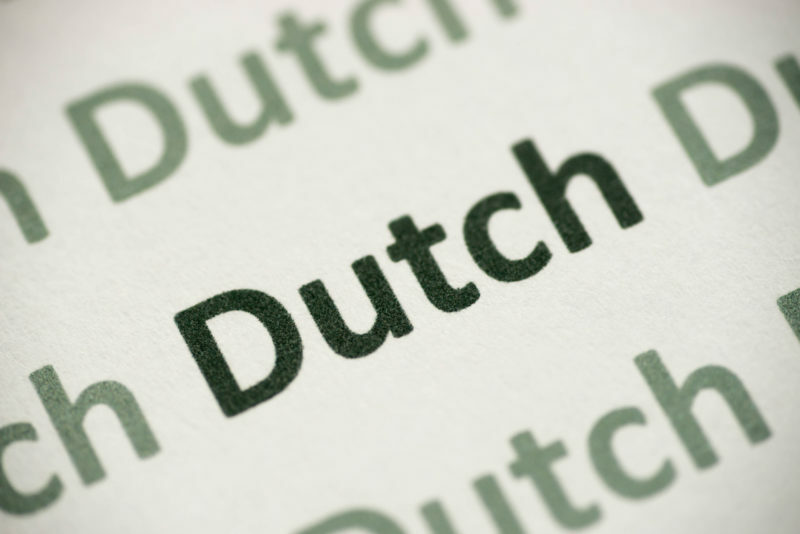 Many Dutch words are written the same but pronounced differently, which can also be problematic in the early stages of learning the language. Here’s a fun thing to try: take a typical Dutch word and play around with removing the double vowels, adding -e’s, replacing g’s at the end with y’s, etc, and seeing just how much the context still remains even in German. With a little imagination it’s easy to see just how much the languages have in common! Will German Give You A Head-Start? When determining what is easier to learn Dutch or German, it’s easy to get hung up on which one’s “best,” when in fact they are mutually intelligible for the most part. While Dutch may have fewer complications when taken at face value, any language’s accessibility depends on the individual. And as always, immersion can make all the difference. In German the G is more or less like the English word “go,” while in Dutch the sound resembles the “chi” in loch. Dutch and English uppercases generally follow the same pattern, while German nouns are all capitalized. Capital (uppercase) letters follow more or less the same rules as in English (with some exceptions like days of the week), unlike German which capitalizes every noun. German and Dutch phonetics also differ. For example, oe is that “oo” sound you hear in Dutch (like the “oo” in English boot), while sj is what would be an English “sh” sound (the opposite of the German sch). Dutch plurals are generally easier, while German vowels, which are quite irregular, may pose some difficulty in the beginning. Every language has its unique turns of phrase. Today, tonight, and this morning are all “van” in Dutch i.e. vandaag, vannacht, vanavond (from da(a)g, nacht, and avond). Next to gendering, this is often the most grappled-with part of learning Dutch. The use of gaan when speaking about the future is not possible in German; instead present tense + context or “werden” (will) is used. In terms of the past, verbs ending in -eren require a ge- prefix, unlike their related -ieren German verbs. In other words, notern > genoteerd > activeren > geactiveered. Obviously there are many more differences to be found in both the Dutch and German languages, but it helps to remember that the two languages share a common ancestor, and aren’t completely foreign to each other. If you’re wondering what is easier to learn German or Dutch, rest assured that’s entirely up to you! Everyone learns languages a little differently; some pick them up right away, while others need a bit more time and practice. Fortunately there are a variety of tools available today to help you master the Dutch language (or any language for that matter! ), such as online courses, mobile apps, and traditional tutoring and classroom structure. Dutch may seem a bit tricky at first, but with some dedication you’ll be chatting in no time.